I've been making flower essence blends for 14-15 years using a combination of training (with the Flower Essence Society) and inner guidance. 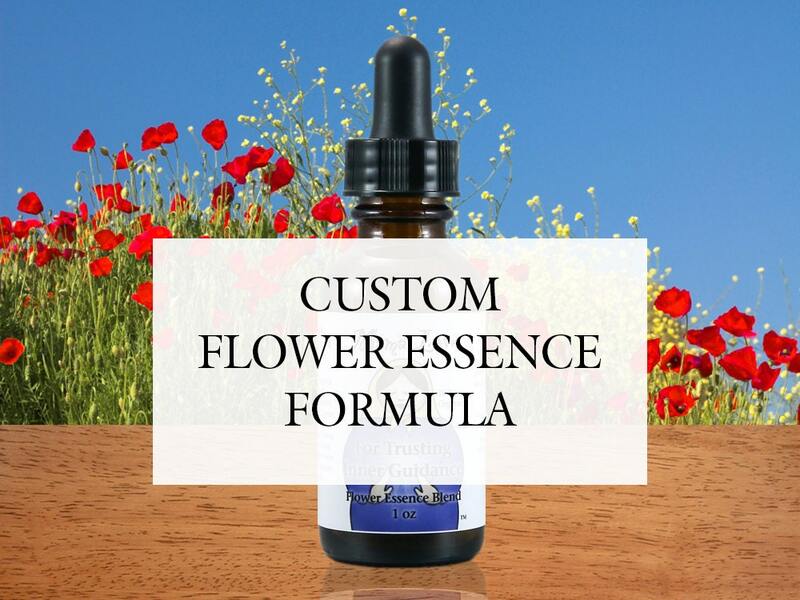 This offering is for an email consultation and a flower essence formula in a dropper or spray bottle, and it is best for people who know what flower essences are (Bach Flower Remedies, for example, NOT essential oils) and have had some positive experience with them. WHY A CONSULTATION? It is challenging for people to be clear about what exactly they want a flower essence formula to do. Typically, people want to tackle too many different issues at once, understandable because we often have multiple things going on! Sometimes there are interlocking issues that can be addressed at once, but for success with this modality is better to narrow the field down to a single overarching healing focus at a time so your body/mind can successfully integrate it. This 1/2 hour consult (2-3 emails plus the time I take to consult my inner guidance, etc.) can help you do that. ABOUT THE FLOWER ESSENCE FORMULA: In addition you'll be getting what is called a "dosage bottle" already diluted to the proper strength to use directly as drops or a spray right from the bottle. It will be Reiki-infused unless you prefer otherwise. A 1 oz bottle is good for 1 month which is the typical period of time people use them. However, some people have found that they use more of the sprays and for long-time chronic issues some people like to use the dropper bottles longer than a month, so I recently added 2 oz sizes to my shop. I use 100% organically grown and ethically wildcrafted Bach flower essences and North American ones from FES, in distilled water with your choice of either conventional brandy or organic vodka as a preservative. It is UNSWEETENED so you don't have the effects of added sugar in your system (but feel free to add it to something sweet if you prefer.) You could also choose a spray bottle instead to use on your skin or in your aura. Some people think they work even better that way. My spray bottles use organic vodka as a preservative because they are less likely to stain your clothing. HOW TO USE IT: Take 5 drops under your tongue or in a glass of water or a favorite beverage 3 times a day every day for a month to help initiate lasting change. You could also add 10-15 drops to a water bottle and sip it throughout the day if you prefer. If you choose a spray bottle use 2-3 spritzes around your head and upper body instead. Effects are cumulative over time. I include an information sheet for special circumstances in your order. What a gift Sheryl and her knowledge of flower essences are. She consulted with me and created a custom blend for my young daughter, who is struggling with extreme anxiety and OCD, and I can't believe what a profound effect the essences have had on her condition. I am so very grateful to have found Sheryl and a natural method of healing for my daughter, and for the hope that it has given us. Sheryl is so kind and understanding and helpful. I am already feeling the benefits of the flower essence she made me. Always wonderful to work with and oh so beneficial. Having that personalization can make all the difference in the world!